This article may contain affiliate links. This means that if you make a purchase after clicking on the link, we may receive a small commission for which we are very grateful. Just 30 minutes from downtown Vancouver, at the beginning of our hike to Bowen Lookout we were approached by a couple. “Do you girls know where you’re going?” asked the older, not overly fit looking gentleman armed with walking poles. “We were actually just wondering that.” I replied. Since he was coming from the direction we were heading we stopped to see what he had to say. “There’s nothing really up this way.” he said and his hiking partner (possibly his grand daughter) nodded in agreement. This was easy to believe since our view ahead showed only a steep, rocky path, bare of trees and any hope of shade. I probably should mention it was a smoking hot day and we had indulged in a few glass of wine the night before. Sure the hike was partially intended to burn off the calories and the wine induced sluggishness but we also wanted to enjoy our afternoon. It’s all about balance people! “If you’re looking to hike to Bowen Lookout you’re going the wrong way. This way is much prettier and probably better suited to your abilities.” I’m not really sure what he meant by that last remark considering we were all at least 20 years younger and seemingly a fair bit fitter. Maybe the wine had taken more of a toll than we realized? Deciding to let the comment go we thanked him for saving us from a hot and potentially painful hike and headed back down the hill to the start of the Howe Sound Crest Trail he had pointed out. As soon as we stepped onto the shaded path and inhaled the pine scented air I for one forgave his presumptuous words. Now this was the kind of hike we were after. The air was cooler, the birds and butterflies played in the dappled sunlight and there were wild blueberries and cranberries growing along the path enticing us to stop for frequent berry breaks. Having originally planned to hike a completely different route we had no idea what to expect, so were thankful that the trail was clearly marked with signposts directing us to the lookout along with several longer trail options. It is a moderate level hike, but it is quite short and the steep grade is broken up with switchbacks. There are also plenty of spots to stop and rest if needed plus room to pass those that do. Within just one hour we had reached the lookout. To say we were pleasantly surprised is a massive understatement, it was hard to believe this hike was so close to the city of Vancouver. It felt like we were in the much more remote area surrounding one of my favorite mountain towns of Fernie, BC. Exclamations like “Wow!”, “Oh my God!” and “How did I not know this was here?” escaped our lips. True to its name there was a perfect view of Bowen Island along with the Sunshine Coast and the Howe Sound and on to the Gulf Islands. The deep blue water was speckled with white wake from the numerous boaters navigating the islands of the Sound. The layers of mountains changed from ultramarine to shades of gray as they receded into the distance and the birds soared high above it all stopping to take a break in the abundant evergreen trees. Bowen Lookout is a stunning Pacific Northwest scene and a perfect example of why this province is known as “Beautiful British Columbia”. If you’re itching to get out of the city but can’t swing a full weekend getaway from Vancouver this beautiful hike is a great alternative. Where is the Hike to Bowen Lookout? Cypress Mountain ski resort is the start of the hike to Bowen Lookout. 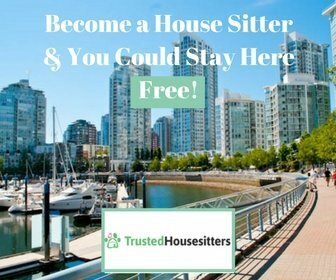 It is on the north shore about a 30 minute drive from downtown Vancouver. See Getting To Cypress for more details. Once at the Cypress resort area, park and walk towards the wood building which is only open during ski season. Along the way you will see large signs showing the maps and details of the various trails. From there just follow the signposts for the appropriate trail. 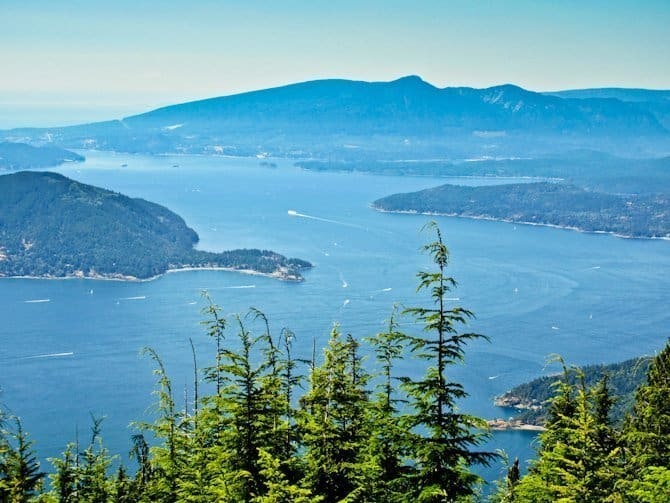 There are many trails at Cypress of varying levels and lengths including the Howe Sound Crest Trail which goes 28 km beyond Bowen Lookout. The Lookout is about 3km round trip and is open year round. Check the trail reports before you go to see what is open and check the levels of difficulty and length of trails. Cypress is a ski resort so some of the trails are not open during ski season. The Bowen Lookout is generally open all year but in the winter you will require snow shoes. Spring, summer and fall are all pleasant times to go especially on a clear day. Sunsets are especially beautiful from the lookout, just be sure to bring a headlamp or flashlight for the hike back. Born in England, Sarah developed her wanderlust at a young age as she traveled around Europe with her parents. As a young adult she spent every penny she could on experiences as opposed to possessions. Eventually she found a way to earn a living doing what she loved: traveling, writing and capturing images of the wondrous world we live in. When not on the go Sarah enjoys time in her “sometimes home” of Vancouver.